The Chicago is a modern and elegant Dining Set which allies sturdiness and convenience. 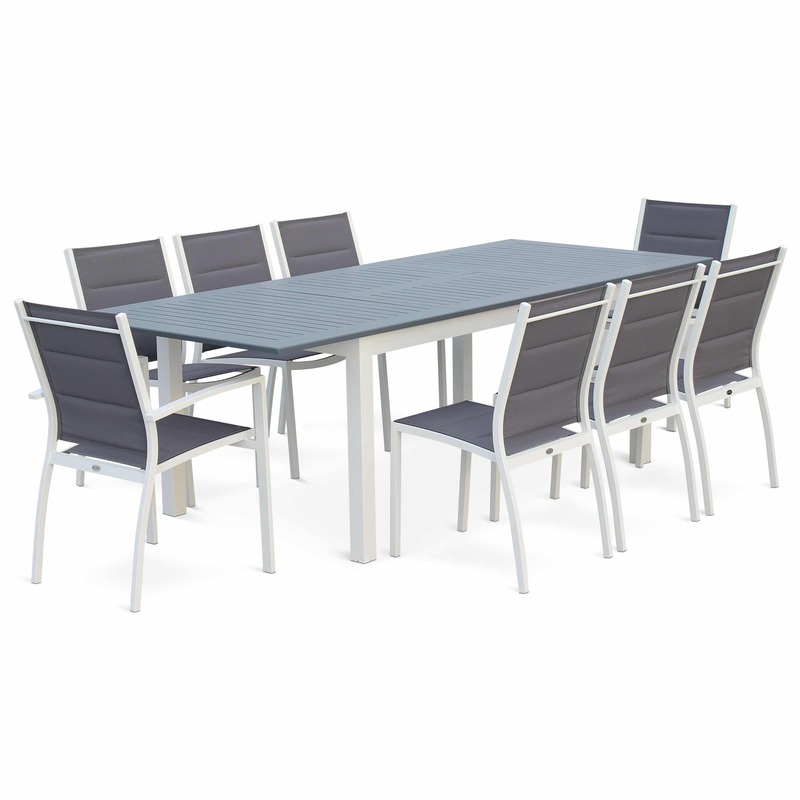 With its astute and proven extension system, this table can accommodate up to 10 guests. Its stylish design combined with an easy-care maintenance makes it perfect for Aussie outdoor entertaining moments while also fitting with indoor places. Classy and elegant, the Chicago Outdoor Dining set has been designed to perfectly fit into just about any outdoor setting. Standing strong with an aluminium frame, the Chicago comes with an extendable table-top for those occasions when you need the extra space. The chairs have been made with textiline fabric, meaning they look great inside or out. Convenience For ultimate practicality, the table extends from 1.75m to a massive 2.45m. This is an extremely easy function of the table to use, just simply pull the ends of the table, unfold the butterfly extension and voilà, you can now make use of a 10 seater aluminium table! Also, each of the chairs stack together and are therefore easy to put away. Quality The materials for the Chicago have been carefully chosen by Alice’s Garden as the aluminium doesn’t rust and the textiline fabric is resistant to bad weather. This is why we believe that they are excellent for outdoor use. At Alice’s Garden, we are proud to say that due to the Chicago Outdoor Dining Set’s durability and comfort, it’s a long-term investment. 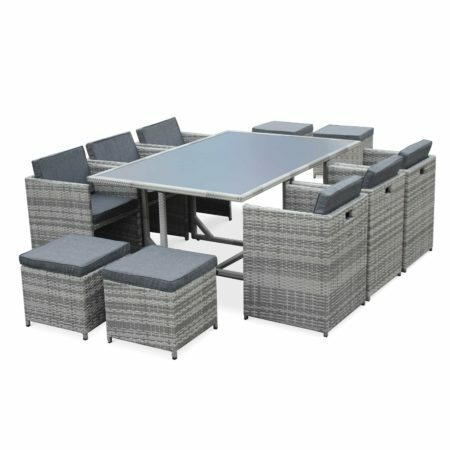 Not to mention the padded textiline make the chairs extremely comfortable as fabric adapts to your body and its honeycomb structure allows it to breathe in hot weather. Please note: The Chicago Outdoor Dining set includes one table, 2 chairs with armrests and 6 regular chairs. Extra Armchairs or Chairs can be purchased in addition to this Outdoor Dining Set on our website should you wish to extend your Chicago set to 10 seats or more. Looking for more? 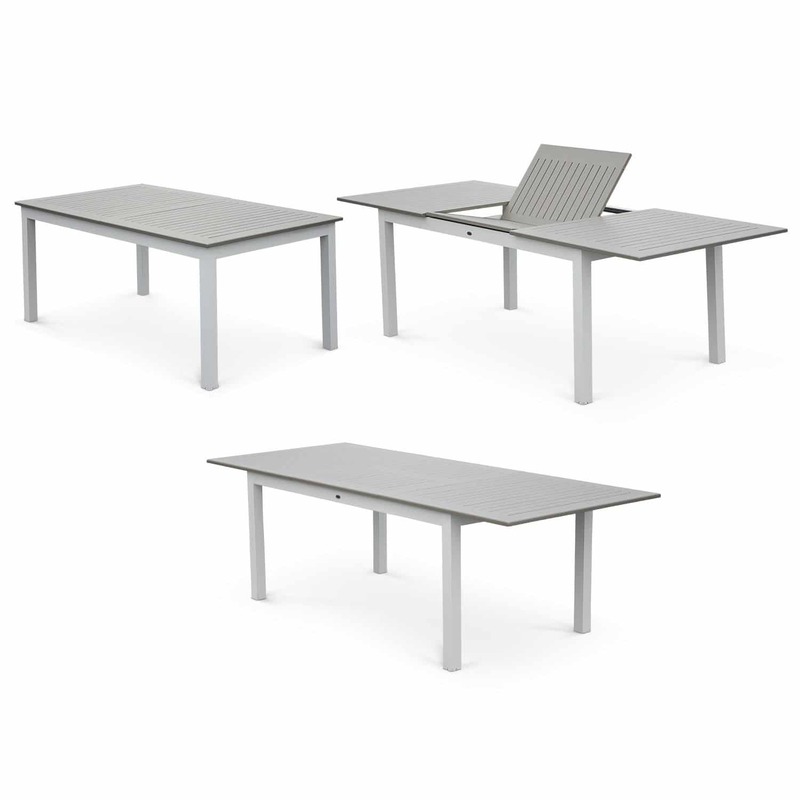 The Louisa Sun Loungers are the perfect addition to the Chicago Outdoor Dining Set! Much like the Chicago, the Louisa set of 2x Sun Loungers also come with an aluminium frame and extremely comfortable textiline fabric. This also makes them the perfect compliment to each other. And if that’s not quite what you’re looking for, have a look at our complete range of Sun Loungers. At Alice’s Garden, we’re very proud of the high quality products and service that we have on offer. We invite you to check out what our customers are saying about us through their reviews on Trust Pilot! Assembly for Outdoor Dining Set : Required only for table, chairs are already assembled. The assembly is very easy since the user guide with instructions is provided.